We moved into our home that we have now when Leo was 3 weeks old! We had known we would be moving for quite some time, so I never really got to nest or set up a nursery for him! Once we moved into our home, I knew that was one of the very first spaces I wanted to work on! When Leo was 4 months old, I finished up his room and I haven’t looked back! I’ve mentioned it before, but my little stinker had a pretty bad “crib chewing” habit! He totally destroyed his old crib and now that he was past that phase I wanted to get him something new! A new crib lead to a new dresser, and a new chair, and heck, I may as well redo his whole room. . . so I did! I wanted to make a space that better represented my boy in this stage in life and I’m honestly thrilled with how it turned out! I started by taking down his removable wallpaper! I love color blocking and so I went ahead and painted a wall mural! It’s super fun and filled with color and Leo loves looking at all the shades and shapes! It was a labor of love for my guy and I’m so happy I did it! Like I mentioned before, this all started because he needed a new crib! 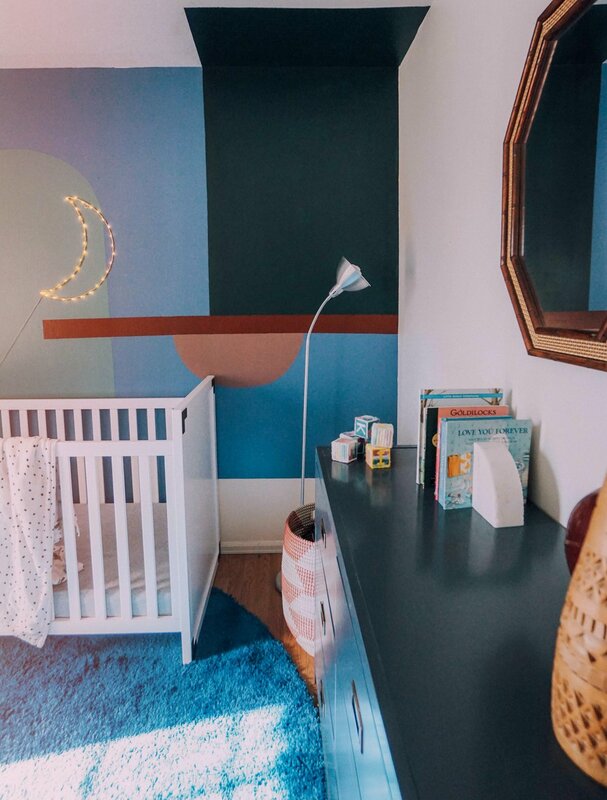 His old crib was a dark wood, which was fine, but I really wanted something lighter to brighten up the space! I decided to go with the Baby Relax Miles 2-1 convertible crib! I love the white against his colorful walls and the aged metal detailing! It was so easy to put together and it’s really sturdy! I also love the full panel sides as opposed to the slats and that it converts into a toddler day bed! His old dresser was the same as his crib; a really dark wood. I wanted something lighter but also a different color than the crib! 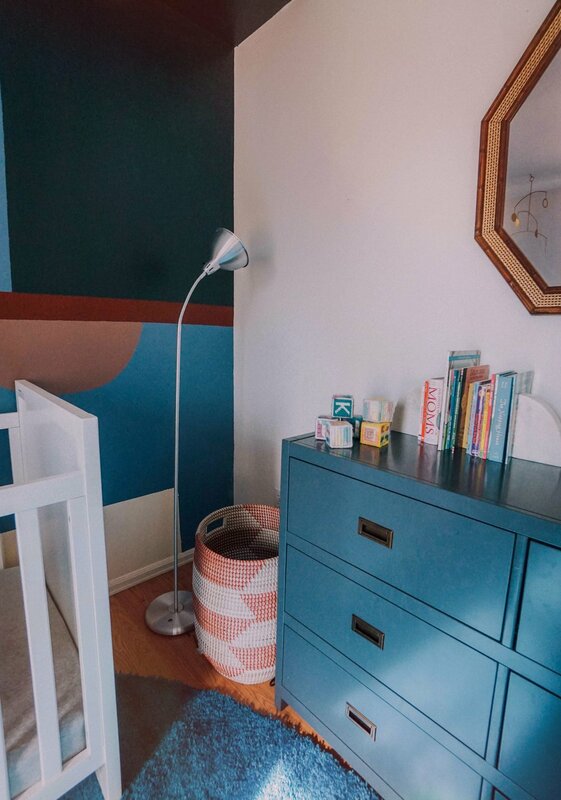 I found the Baby Relax Miles 6 drawer dresser in Graphite blue and it is perfect! 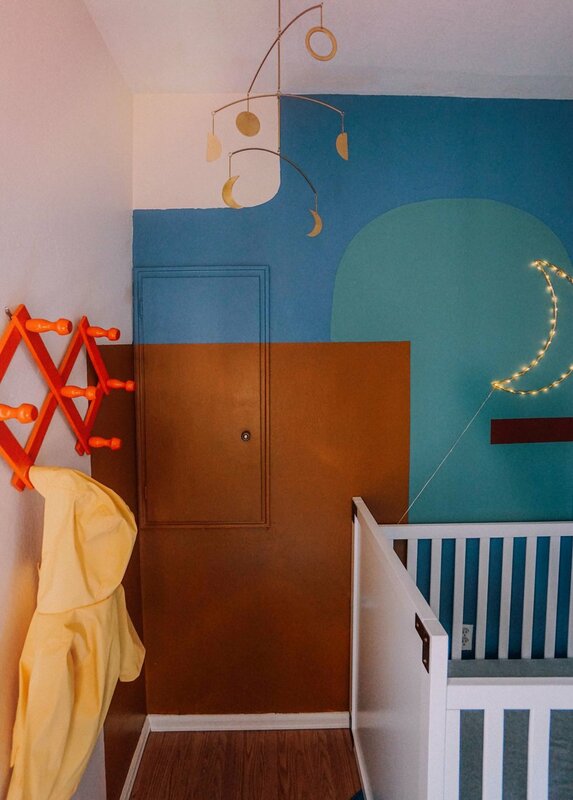 I love how the color goes with his wall mural and how it has the same aged metal detailing as the crib! It’s nice and cohesive without being too match-matchy! Both of these Baby Relax Miles pieces can be found at Walmart and are really affordable and great quality! Now that the statement wall and big furniture pieces were done, I was ready for decor! I have a couple rugs from Well Woven Rugs in my home, so I decided to check out their website and I came across the Plain Dark Blue Modern Shag Rug! 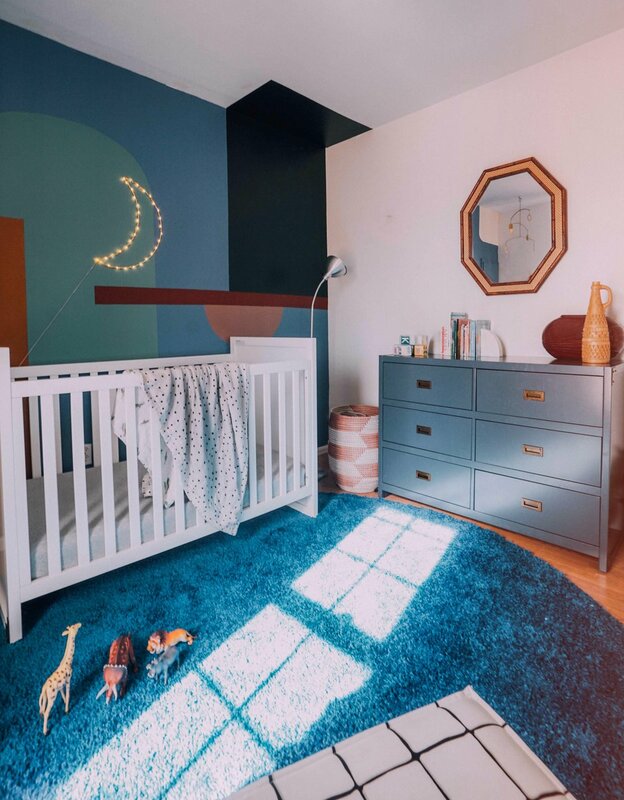 I’ve been obsessing over electric blue and I loved that this rug was round! 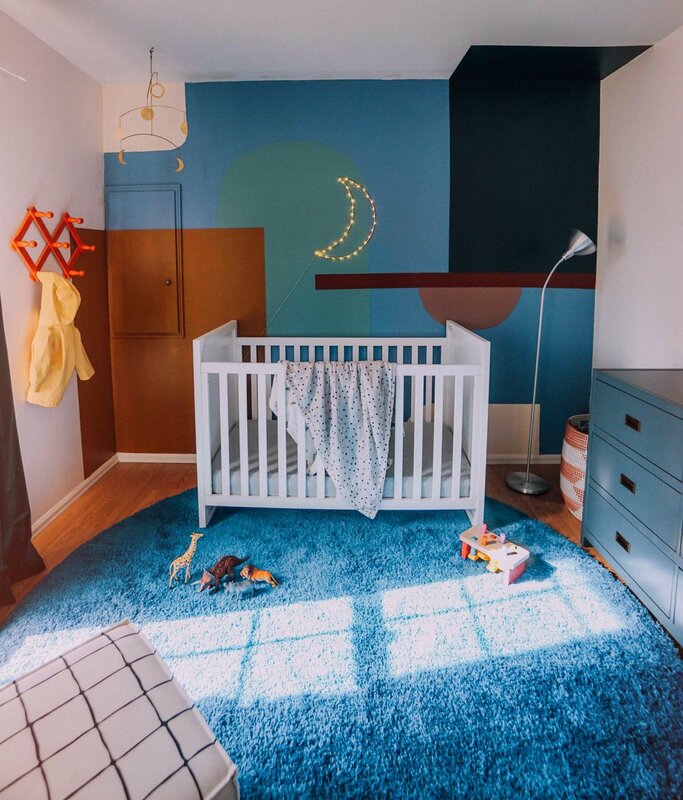 It was perfect for his space and blends perfectly with the shapes on the mural and I love the texture of the shag! 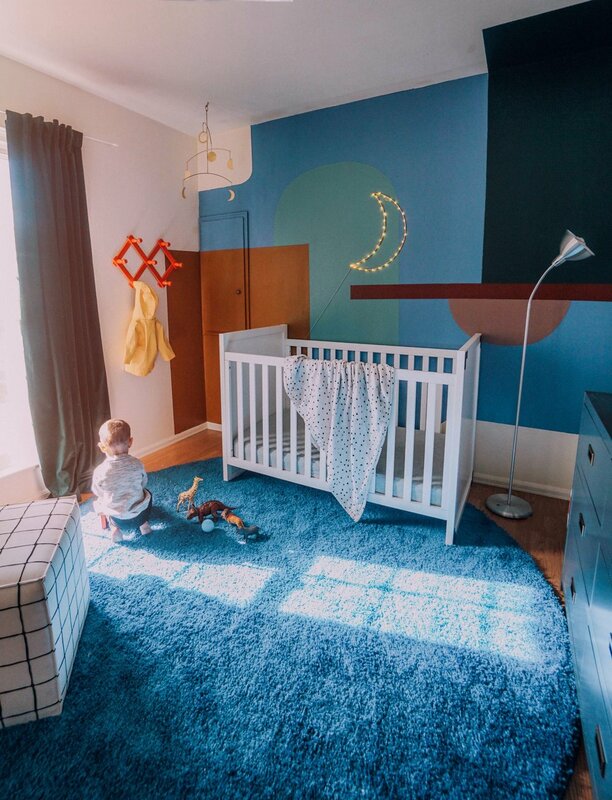 I knew I wanted something simple behind his crib and his old room had a moon theme, so I decided to keep that motif! I found the cutest light up moon from urban outfitters as well as the moon phase mobile! We secured the cord for the light up moon on the outside of his crib and strapped down the tiny little battery pack that way he cant get to it! 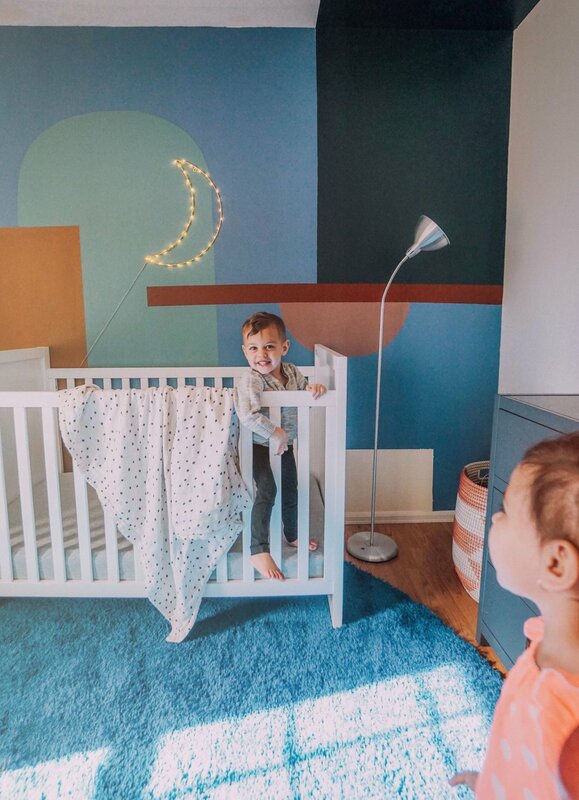 It’s the perfect little light to calm him down before bed and I love how it plays in with the shapes on his wall! There you have it, a “Leo” room! 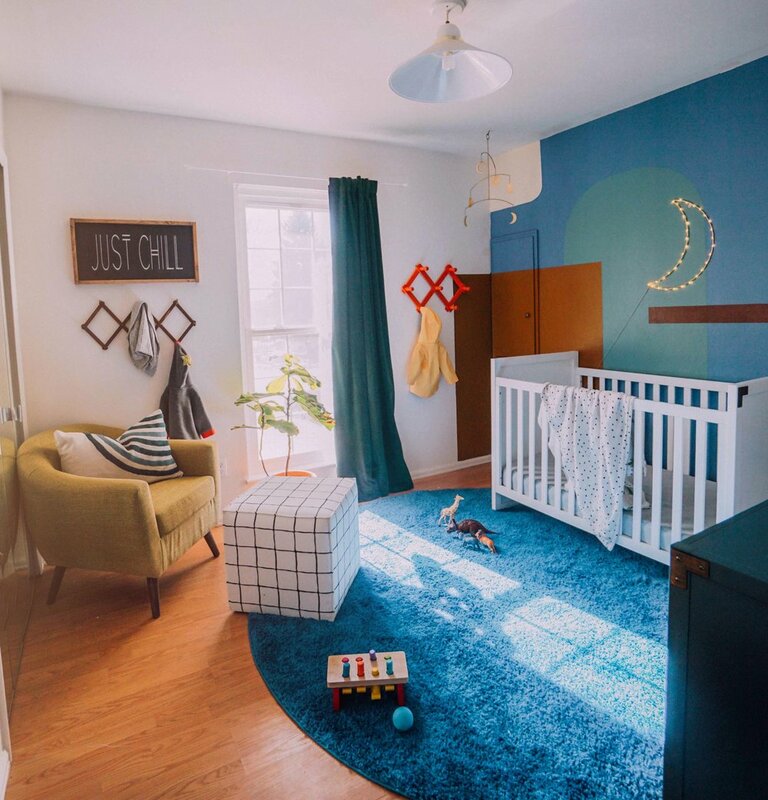 My boy is the sweetest thing and such a little lover, but he’s also fearless and crazy independent and I wanted this room to be something that reflected him a little more and made more sense for his life right now! I’m so blessed to be his mama and so excited to watch him grow in this space!